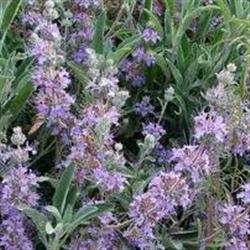 This plant is a compact, upright species of sage and is common to the San Diego area. The shrub grows to a small 3 feet by 3 feet bush that is loved by hummingbirds, bees, and other pollinaters. The dark green foliage and reddish-purple stems are a good back-drop for the crystal blue flowers that emerge in spring to early summer. It requires a little summer water and is cold-tolerant, being found in coastal chaparral regions. I have 2 clusters of this sage in my nativescape planted 10 years ago. They are still going strong. One of first to flower if there are winter rains. But also first to fade. Lots of bees and some native flies when blooming. Stress deciduous in summers, but comes back strong with rains.